There is one common issue that affects performance dogs as well as older dogs. It is sub-clinical pain or “aches” in the muscles of the lower back and/or muscles of the hips. Clinically these usually do not present themselves in the form of a physical problem or illness. These issues are not typically recognized by the owner/handler. I will usually pick them out while taking a history from the client. There are certain tag words or descriptors that help to identify the problems. In older dogs, some descriptions include “not getting around like they used to”, “can’t get on the couch anymore”, “having problems getting in the truck” plus many others. In the older patient they are related to actions where the dog needs to lift up their front end. In performance dogs they may be described as a change in performance, a change in their jumping abilities or maybe a reduction in speed as well as other performance changing descriptors. Sometimes it is seen as a plateau in the performance abilities. For example the dog may have been getting better or improving but recently hasn’t shown improvement or has begun a decline. Their are multiple reasons for these issues but the biggest step to relieving the problem is to recognize that they are there. The cause of these problems typically occur in the epaxial muscles of the back. Thermographic image showing the inflammation or heat over the muscles of the lower back. In the image Blue is cool and White is warm. 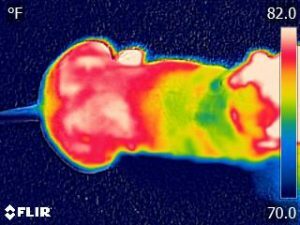 The thermographic image of the dog’s back shows the increase in heat emitted by the musculature of the lower back (it appears as white over the lower back). The epaxial muscles are on the dorsal (top) side of the vertebrae, and include the longissimus dorsi, iliocostalis, transversospinalis muscles. In the performance dog world, many times these issues are thought to be a problem in the iliopsoas muscle but, in actuality, have nothing to do with that muscle. The iliopsoas muscle along with quadratus lumborum and psoas minor, make up the the hypaxial muscle group on the ventral (lower) side of the vertebrae. The muscles of the hip can also play a role in these problems. The biceps femoris, gluteals, quadriceps, tensor fascia lata (tfl), sartorius, semitendinosis, semimembranosus and gracilis. The most commonly affected hip muscles are the quadriceps, tfl, gracilis, semitendonosus and sartorius. When working up a case like this, it is important to take radiographs of the area to determine the level of orthopedic and vertebral involvement. It is also important to do some blood tests to determine if there are any tick borne diseases involved. Palpation by a skilled veterinarian who has experience dealing with these types of cases is also needed to identify any musculature involvement. Usually the muscles involved will be tense and more firm than typical normal muscles. Treatment by this author usually involves a therapeutic modality (laser or NMES), a combination of oral medications that specifically address this kind of pain and 5 days rest. After that the athletic patient can go back to work or the older dog can just enjoy living and moving pain-free. Typically this can be corrected in one visit although sometimes it may take a few more modality sessions. The author typically avoids therapeutic exercises in these cases while treating the muscle issues. The exercises can delay the healing processes and can exasperate the pain problems of the muscles. Dogs are very good about dealing with low-level pain. They are not capable of relaying these issues to their owner. Therefore it is important that we learn to how identify these issues so that we can address them appropriately.